The first thing that prayer is is communication with God. 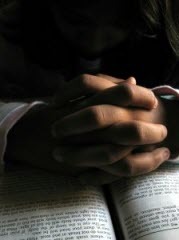 If language is a gift of God then prayer is, or ought to be, the first or primary use of language. As such it is the first voice of the creature—whether audible or in silence—speaking to the Creator. As such it is never speaking to some “god,” but is always speaking to the God. If in no other way (and I do not say there are not other ways) this is what sets true prayer apart from false prayer. False prayer is a counterfeit because the god to whom it is offered is a counterfeit. Do we offer up pleas and praise to a divinity who smiles sedately upon all our trivial worship styles and our romanticized views of the Christian Life? That is not God. Do we pray to a cold, distant, offended deity, who moodily withholds answers because he is upset with us even after we have repented? Then our prayers are directed to a false god—one of our imagining. In either of these scenarios it is ignorance which is the problem. And here I am addressing people with a Bible and a profession of faith in Jesus Christ. I say it again, true prayer can only be given to the true God, the God who reveals Himself in His holy Word. compassionate and gracious, slow to anger, and abounding in lovingkindness and truth; 7 who keeps lovingkindness for thousands, who forgives iniquity, transgression and sin. This is a God to whom we can come with eyes open and hopes raised. Let us be encouraged. This is the covenant God of hesed—of steadfast devotion to us; sinners in a fallen world. We see God in the work of Jesus Christ for us! God looks down upon what He has made with beneficence. He calls the world as it is, an evil world, but He has not turned His back upon it; He values it. He loves it still. How much more does God care for those made in His image? And how much more than that is God well disposed to those who are renewed in the image of His Son? If His “tender mercies” are over the creation, we ought to confidently persuade ourselves that we can indeed come boldly before the throne of grace at any time. In this evil world we cannot find rest from anything in the world. But we can find it in the One who made it and who watches over it. He knows our frame; that we often are weary and heavy laden. Our world is never going to be right—not until it is Christ’s world, with Christ Himself governing it in uprightness and equity and peace. God having left us to shine in this world for a time understands that it will “get to us,” and He has ordained prayer so that we can transcend this realm in relationship and experience and reality. Although I shall return to the subject, it should be emphatically stated that there is a great difference between the head and the heart in matters of prayer. I don’t say the head is not involved. I shall insist that it must be. But where the heart and soul are uninvolved, we are not praying. And how can we speak to God if we do not contemplate who He is? He is a “Come unto Me” God! That is why prayer exists! He is an “I will give” God. That too is why prayer exists!